Decorate Me Pretty: In Vogue!! According to the recent Vogue 'Tribal' seems to be the buzz word. And I say when something is buzzing on the runways then it ought to trickle down to our abodes too. So I dug up some Tribal flavor to create some displays for the purpose of today's post ie. A humble effort to bring the latest fashion trends to your homes. Dress up the couch or a couple of chairs in colorful tribal printed upholstery to bring that zing to your home. And if you belong to the lesser experimental lot then just go with accessorizing, look how the printed accessories bring character to this room. Also I am in love this classic coffee table, isn't it gorgeous? Reptile skin is in and how! Be it these Hermes bracelets or this Picabo chair by Hancock&Moore, helps you add that oomph factor to the whole look. This style surely spells luxury! Jungle/ leopard prints were present everywhere, loud and clear, the whole last season. But it's easy to produce a garish display by using too much of this print, so I suggest using just a hint to give that suave and sophisticated look to your home. 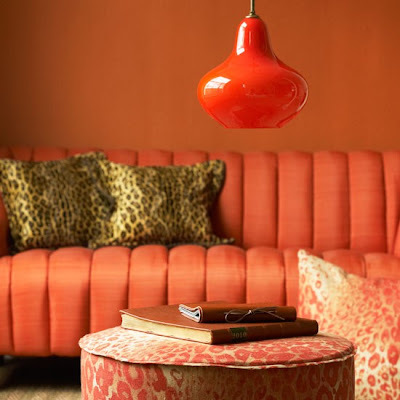 Tangerine and gold - what a great combination! 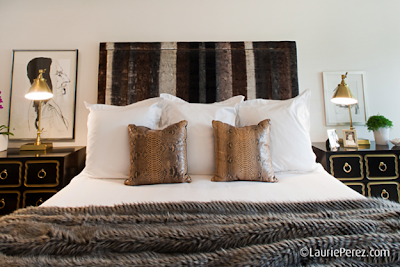 I personally love fringed bags and find them very chic but when it comes to using fringe at home, I think they probably belong only on throws (Beige Ralph Lauren throw in the above picture). Gone are the days when we used them on cushions and drapes. 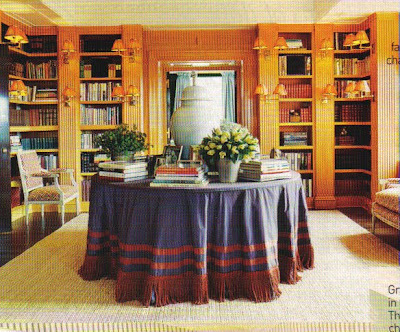 Although, an old picture of Tory Burch's study with a fringed table cover suggests another great use, seems real elegant to me! Do let me know what you think about these trends via the comment box below. Ciao! Hi, I think your website is really cool, I love the African Tribal images. I have made a note of your blog. Hi, also I really am begging to ask you how did you get your blog noticed so people can read your posts.